WELCOME to "Beyond the Numbers: Communication Skills for Accountants," by Bonnie Gross of SpeechScience. This is our second video series on how to improve your presentation and public speaking skills. We call it "Delivering Dynamic Public Presentations." 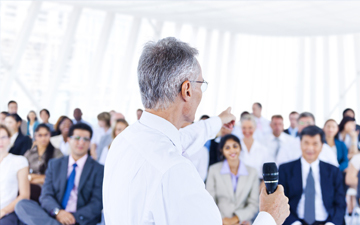 Whether you're speaking at a conference, an AGM or delivering year-end financials to an internal audience, delvering dynamic presentations will help you in your career. We post a new video in the series every Friday, so check back with us on a regular basis, or subscribe to our newsletter and never miss a story. Delivering dynamic public presentations, 2/8: What's your purpose?